Stevie English Hair: O&M Best New Product! Well this is big news! 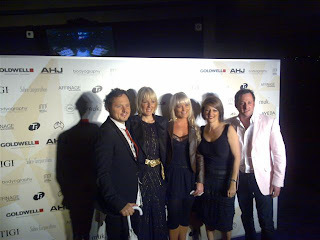 On Monday night I went to the Australian Hairdressing Awards with Kirsty, from the shop. Al, Jose and Marylin from O&M, our wonderful product company. They had been nominated in the Best New product category, And best Packaging. We all went along with no expectations other than to have a good time. But.......they won! I can honestly say we were all so surprised, most of all Alan and Jose. O&M is a relatively new company and they were up against the industry big guns. The product, Seven Day Miracle, is fantastic, but we did not expect to win AT ALL. So after we all recovered, we partied! I really believe in O&M, their products and their philosophy, and Al and Jose are great mates of mine and of the salon. It was so cool to see them get some recognition for all their hard work. Congratulations O&M!! 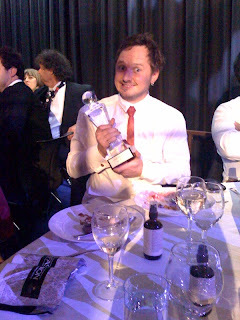 OHHHHH and that's me with the award, yes like the cat that has the cream.